Have you noticed that your old one dog collar spoiled the shiny thick fur of your four-legged friend? Did it visibly lose its appearance in the dog's neck area? This problem must be resolved immediately! Order this wonderful Sparkling Brass Dog Fur Saver and keep your pet's coat in a perfect condition! 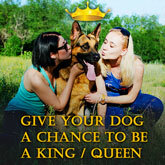 Walk and train your canine without any discomfort! This collar has 1/9 inch (3.00 mm) link diameter while the length of the link is 1 4/5 inch (4.5 cm). Being produced of the strong and reliable brass metal, the item will serve you and your fur friend for a long time. Rust and corrosion resistance will keep the collar's appearance in a good condition. Thus, your doggy will be provided with an ideal protection and magnificent look at the same time. If you want the gear to fit your pet snugly, it is recommended to measure his head circumference and add about 2 inch (5 cm) to its original size. If your beloved friend is still a growing puppy, it is forbidden to put the small size of the collar on your dog's neck, in case if he gained extra weight. The weight of this brass fur saver depends on its dimension 18 inch - 26 inch (45 cm - 65 cm) and varies from 3.24 oz - 4.12 oz (92 g - 117 g). stick to the sizing chart, when placing an order, to choose the best fit collar for your furry friend.